Fall sports have been good to me so far this year. I’ve been busy pretty much every weekend. My recent trip was up to Mt. Pleasant for a CMU Chippewas football game. It was my first time at CMU and only the third time I had even been to Mt. Pleasant, so I was excited to see more of the town and of course, the CMU football stadium. 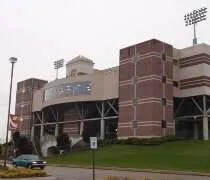 Kelly/Shorts Stadium is the home of the Central Michigan University football team. It sits just off BR 127 at University Park Drive and W. Campus Drive on the southeast corner of the CMU campus. The stadium opened in 1972 with a loss to win over Illinois State. At that time, the stadium was simply called Perry Shorts Stadium. In 1983, the name was changed to Kelly/Shorts Stadium to honor former football coach Bill Kelly. When my parents come to town, I pretty much expect going to a casino. I don’t expect it when J’s parents come, but we were in Midland and needed something else to do up that way, so I suggested Soaring Eagle. I had been there once before with my parents, aunt, brother, and sister-in-law. 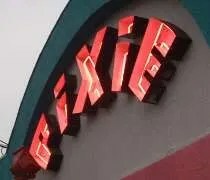 My parents loved it calling it one of the nicest casino’s they’ve ever been to. My brother hated it. He tried turning $20 into $80 so he could pay for a hotel room back in Lansing. Instead, he lost $80 in about fifteen minutes and pouted the rest of the night. Soaring Eagle Casino is on the edge of Mt. Pleasant off of Leaton Road. The whole property is beautiful. In Illinois, all the casino’s are built around old riverboat casinos, so they don’t look anything like the Indian casino’s in Michigan. There’s an abundance of parking. We found a spot in a lot that was a little bit of a walk from the entrance. After a big BBQ lunch, I needed it. I had family in town for the Memorial Day weekend. On Sunday night, our two options were either sit on the couch and watch the Sprint Cup Race or we could pack up and head to Mt. 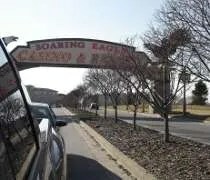 Pleasant and spend a few hours at Soaring Eagle. Gambling is always a good option with my family so we headed north. I didn’t realize Mt. Pleasant was 75 miles from Lansing when we started. I put the address in my GPS and after a few minutes, I looked at the miles and thought “Oh crap!” I told everyone it was only a half hour or so. After a quick conference..actually, I just asked my dad, he said “Go,” so I went. It was about 7:45 when we left Lansing and the only other meal we had eaten was at about 2:00 when we ate at Wendy’s, so finding a restaurant before we hit the casino was a must. I had read somewhere about a really good pizza place in Mt. Pleasant…and like gambling, pizza is always a sure bet in my family. 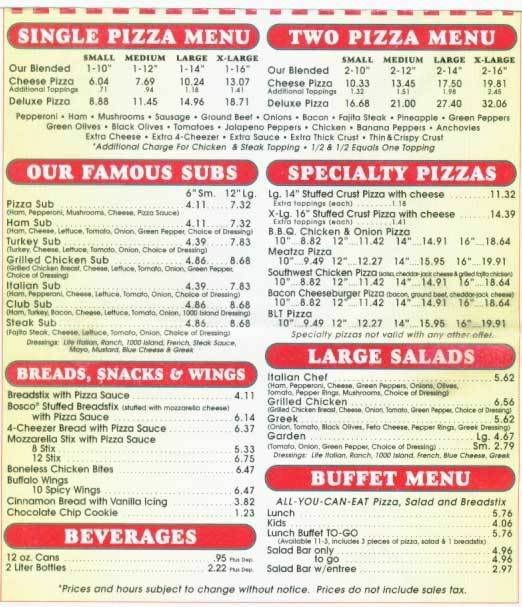 I did a quick Google search for “Best Pizza Mt. Pleasant, MI” and Pisanello’s popped right up. I figured this had to be the place. 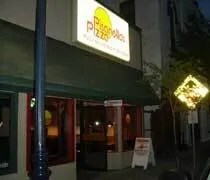 I didn’t realize it until I started writing this review, but Pisanello’s is actually a small chain with nineteen locations in Ohio and Michigan with the original being in Alliance, OH. The Mt. Pleasant location is located in a small building in downtown. There were just a few booths and one table big enough for our party of seven. We noticed a sign that said “order here” so my mom and I went up to the register to place the order. We started with an order of breadstix. The order consisted of six breadstix dusted with parmesean cheese. A marinara sauce came on the side for dipping. There were six breadstix and seven of us, so as you can imagine, we tore through them in just a few minutes. Next up were the pizzas. We got two 16″ pies for the seven of us. One of them we got half cheese, half pepperonni. The other was half sausage and half bacon. They were both a thicker crust, but not a Chicago style. They were actually very similar to Papa John’s pizzas, but they tasted much better. the crust was chewey and the cheese was piled on. The pies came out smokin hot and the cheese was stringy, but stuck to the crust. I had the pepperoni side of one of the pizzas and the pepperoni’s were cooked perfectly. I like it when the meat has a little crunch to it and these did. When all was said and done, there was one piece left between the two pizzas, so the portion was the perfect side. As a bonus, both pizzas came with a cup of garlic dipping sauce (again, very similar to Papa John’s) for the crust. The hit of the evening was definately dessert. My mom noticed a “dessert pizza” on the menu and had to give it a try. She didn’t have a very hard time convincing anyone else it was a good idea either. About the time we were finishing up with the pizza, the cook brought out the dessert pie. A small pizza crust was covered in cinnamon sugar and vanilla icing. I think we may have fought over this one a little bit….I think everyone at the table would have loved to eat the whole thing themselves. It was delicious. Everyone looked at me asked if I could do that at home. I probably could, but I don’t think it would be as good. My family is usually pretty tough to please when it comes to pizza. Some of them like thin crust while others prefer the thicker crust. Everyone left with the same opinion of Pisanello’s though. It was delicious. In the past, I’ve mention my quest for the perfect pizza. This wasn’t quite that because it reminded me a lot of Papa John’s pizza which I also like, but don’t love. Pisanello’s was a great choice for us. Everyone was very happy with the food, but even better, we ate all that food for $30!